From Butler, go north on US Highway 71 to Passaic. Go east on D Highway for 10 miles to BB Highway. Turn left (north) on BB and go 1 mile. Turn left (west) on the gravel road (county road # 8004) and go ½ mile. Cemetery is on the north side of the road. The Bethel Cemetery was located in the churchyard of the Bethel Methodist Church. The first marked burial is 1869 but there is evidence of earlier burials. The church was discontinued and the building no longer exists. 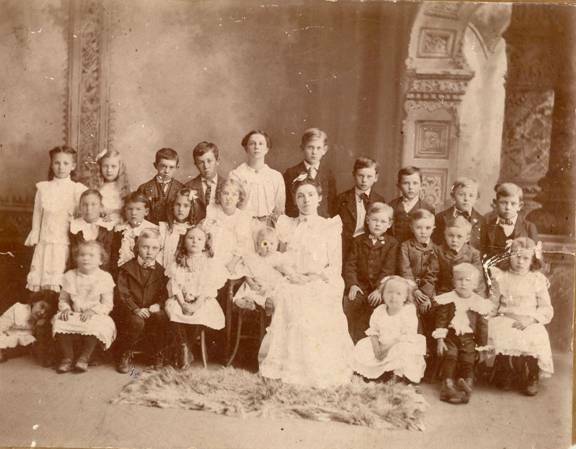 Bethel Sunday school class – If you can identify anyone please contact us with details.